Mail for Mac might be a great service for the majority of Apple users, but some require a more feature-rich service to use on a daily basis. 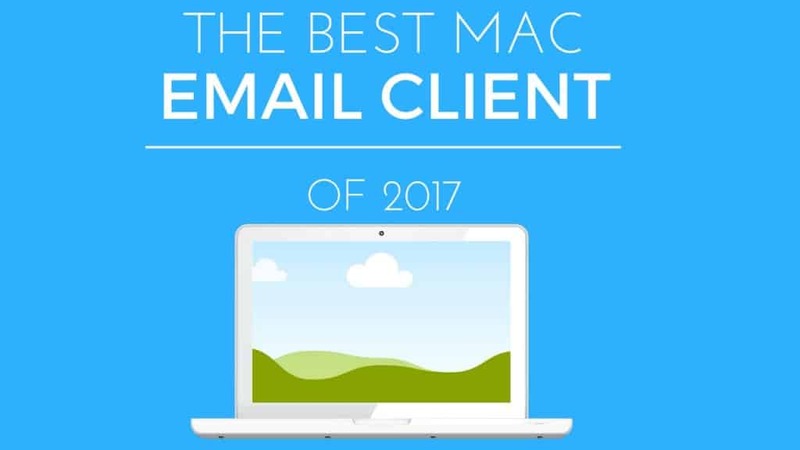 Below are the top mac email clients this year that support in-app integration, multiple account setup, quick replies, and much more. To help you pick out the best email client for your use, we reviewed the best ones of 2017 below. Airmail is arguably one of the best mac email clients of all time. Currently, it is in its third generation and is optimized for outstanding speed, reliability, and stability. Not to mention, it is currently one of the most fluid apps that matches the built-in Mail app for OS X.
Airmail features one of the most visually appealing designs out there today. It can support email providers like Gmail, iCloud, Yahoo, Outlook, AOL, and even more. Also, it comes with a ton of features such as gesture support, quick replies, filter management, unified inbox, and much more. It even supports apps within apps such as calendar, reminders, Evernote, Fantastical, and more to have a more integrated feel. For coders out there, airmail even includes AppleScript support and other code related programs to help personalize your mail experience. Unibox is one of the most unique mailboxes in its approach towards group email organization and message interaction. This includes one of it’s greatest features of being able to view a full context of past emails on the person you are currently talking to. This means that, if you have not emailed someone for a while, you receive an instant remind of your personal history. Even if it’s not entirely something you might think you’d use, it can help better manage your time. Other features Unibox supports include POP3.IMAP, attachment email grids, multi account support, email previews, quick actions, and much more. Also, to match the email on your phone, it comes with a handy IOS app for ease of use. Unibox is not a Mac email client for everyone, but it is truly one of the best ones out there. Postbox is all about managing your emails for heavy users. They make managing emails as easy and efficient as possible for their users. To do this, it has a 4 part interface design called the Focus Pane which separates and labels emails based on attributes such as reminders, subscriptions, attachments, etc. Other features include favorite contact optimization and topics which break larger emails into chunks for easier viewing. If you browse around the email client you’ll also notice account groups, tabs, and a favorites bar. Also, check out the quick replies feature Postbox sports, this allows you to customize a set of basic templates in case you send out frequent responses. Postbox is available for MacOS and Windows. Inky’s main focus is cyber security. They ensure that each and every email is sent to the correct person and is as secure as possible. It does not matter what email provider you use, each email will be encrypted and digitally signed. Users of multiple operating systems can rejoice as Inky is available on Mac, iOS, Windows, and Android. This email client also provides a serious search index which allows you to find emails from the past, no matter how old they are. You can also be logged into multiple email addresses and use smart email suggestions to ensure your email is sent from the correct account. Inky also provides cloud-based settings profiles to make use easy on all of your devices. If security is your main concern, choose Inky for your Mac email client. CloudMagic just recently became available for use on the Mac desktop after it got its start as an email client on the iPhone and Android. Having been around for so long, it is no wonder that this client performs so well. It features a very clean and pleasant interface. CloudMagic also ranks high with functionality as it can support Gmail, Outlook, Yahoo, Office 365, Exchange, and more. Though the price may be on the higher end, it is worth it for all of the helpful features. Users can enjoy a unified inbox, filters, keyboard shortcuts, standard set of aliases, HTML support, and more. Email clients serve more than just a purpose of replacing lower-grade built in applications. They sport incredible features to give a better overall performance and help you manage your time along with email customization. Among the best mac email clients we listed, the best one you could possibly use today is Airmail. It is a simply fluid app, contains more high-quality features, and allows for interaction among some of the best mac apps within the email itself. Not to mention, it is easily one of the most popular email clients to date.